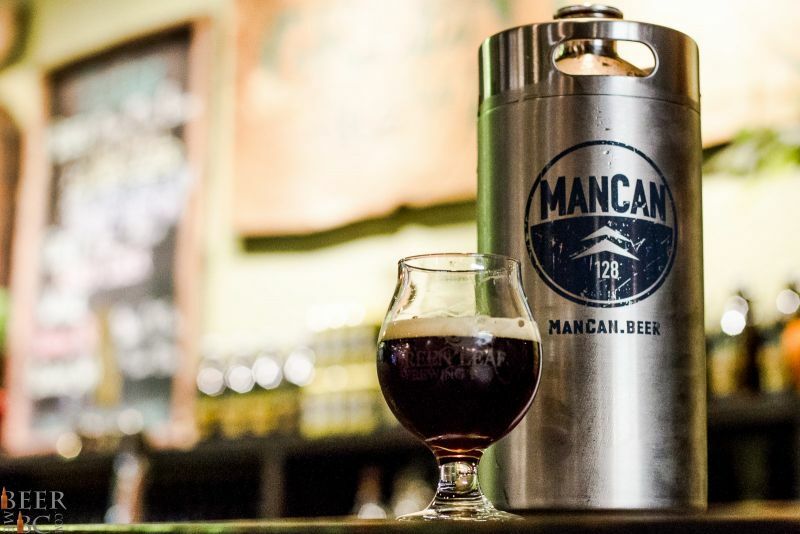 If you are a fan of filling growlers at your local craft brewery you are likely well aware of the downfalls that come in the territory. Once you crack open the growler the clock is ticking on how long your beer will last. 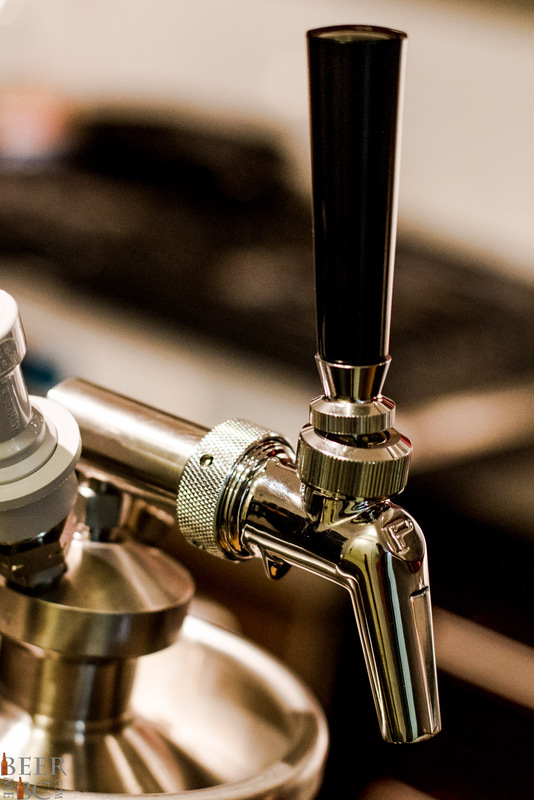 Not only is oxygen wreaking havoc on your beer but it is also losing carbonation by the minute. Enter the Man Can, a new, C02 charged growler system that is designed to keep your beer fresh while being practical and very functional. 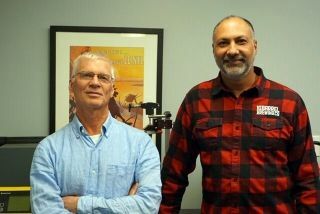 The Man Can comes in two different sizes. There is a standard, 64oz metal canister, as well as an oversize 128oz version. With a standard style-growler you would likely never look at 128oz as an option, but here it is a rather interesting proposition. The actual cannister is just the beginning. While pleasing to the eye on its own the real intrigue comes through the add-ons. 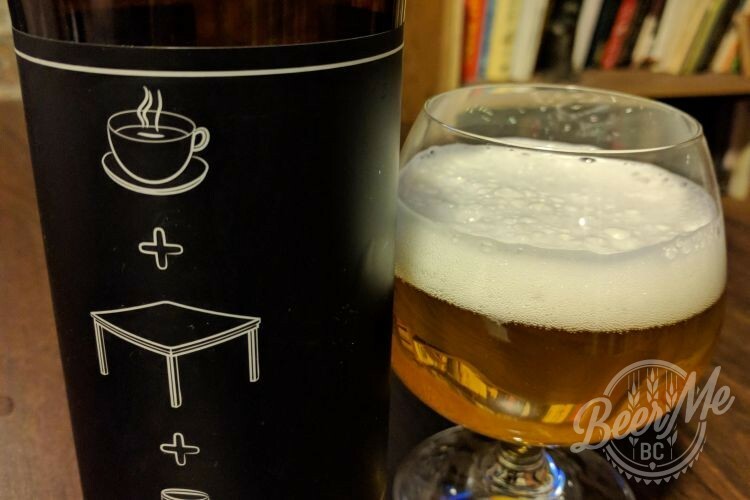 Beer Me BC has tested the premium option called the Machismo Kit here. 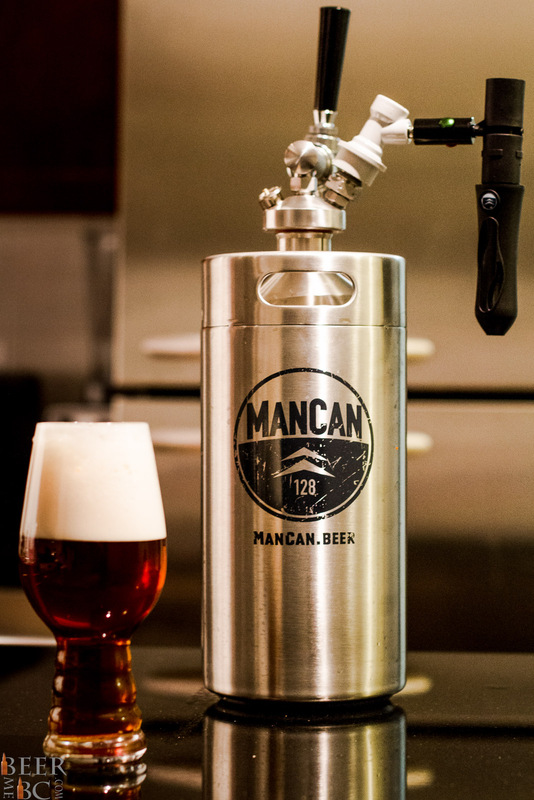 Included in the creme-de-la-creme kit is the 128oz Man Can as well as a CO2 attachment and Perfect Pour tap system. What are all these appendages you ask, Well the Perfect Pour tap is a standard, bar-style pouring spout. It even has a standard thread tap handle where you can attach your favourite brewery’s handle. 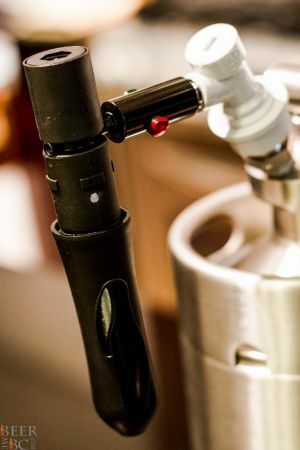 The CO2 attachment is called the “2-stage regulator system” and is a removable CO2 charging system to keep CO2 pressure in the can while keeping oxygen out. 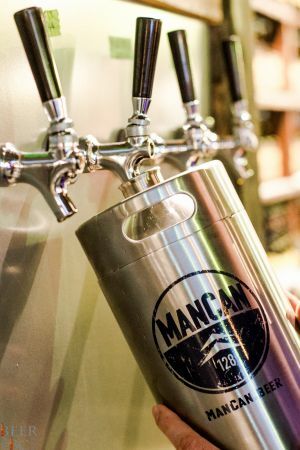 Upon receiving the Man Can in the mail we immediately took it to a local brewery to get it filled up. 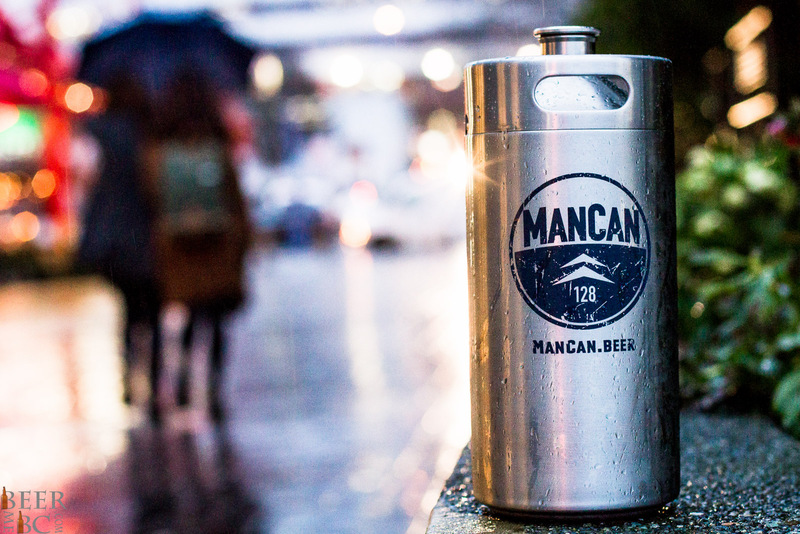 With a secondary cap, the Man Can is easy to carry using the integrated hand holds. 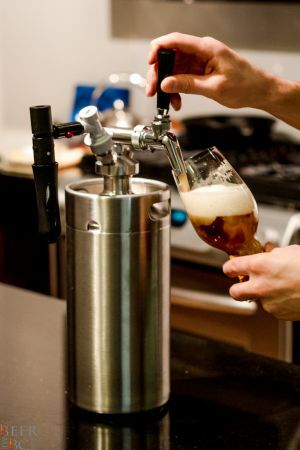 From a brewery’s perspective, the can may not fit in your standard growler filler but a tap-extension works just fine. It is difficult to tell when the can is close to full during the filling process but that is only a minor detail. Because of the nature the system there will always be a small amount of oxygen that gets into the Man Can. Once you bring home the full growler from the brewery, you will need to remove the transport cap and install the pouring system. This means that even if it was purged of oxygen with CO2 at the brewery, a small amount of air will inevitably enter the cannister. Once you install the tap system though, you can charge the can with CO2 which reduces the proportion of oxygen significantly. As you make your way through the beer, CO2 will continue to fill the canister from the cartridge and further dilute any oxygen at the same time. 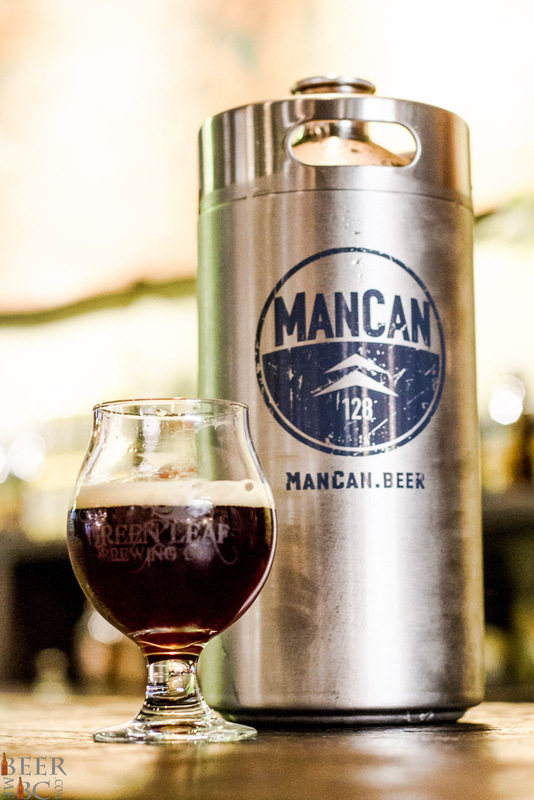 Compared to a standard growler, even when half full the beer remains fresh and carbonated. Leaving the Man Can in the fridge for a week half empty does not seem to pose a problem and if you can somehow make the beer last longer than that you are likely still in the clear. There are a few small things that are worth noting about the Man Can before you fork over US dollars (or 1.4 dollars as I like to call them). If you order online and ship to Canada, there will not be any CO2 included in your order due to shipping regulations. You will need to venture to your local bike shop or hardware store to find some 16g cartridges. Also, The can is quite tall and will not fit vertically in the fridge. You will likely need to detach the CO2 and remove the handle in order to lay the Man Can on its side in the fridge. Don’t worry though, it will hold the CO2 charge when you do this. When we first started using the Man Can we were seeing some excessive foaming when pouring. We found that after pouring a beer, if we pulled the pressure release pin, then recharged the cannister the issue was fixed. This is likely just an issue when the canister is full and there is a very low volume to be filled by the CO2 pressurization. The Man Can 128 Machismo Kit runs with all the bells and whistles at total of $265.00 USD. There is also a more basic version called the Flex Kit at $195.00 that achieves much of the same benefit. 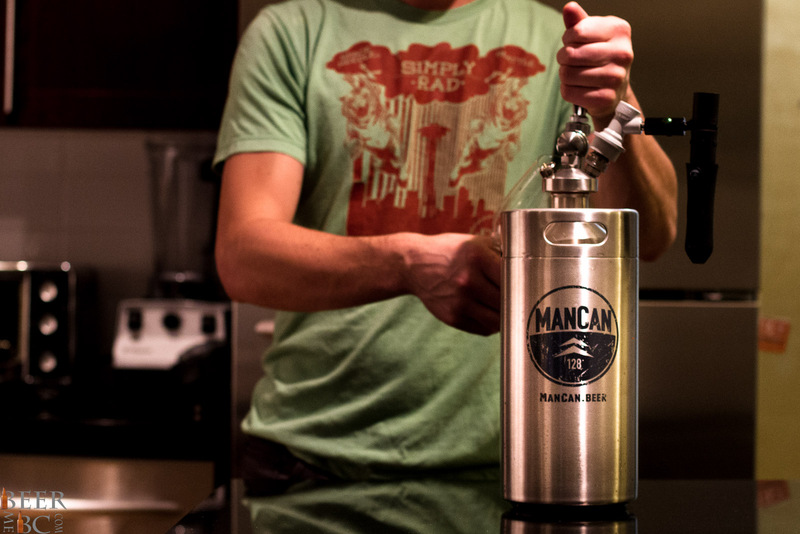 Alternatively, you can also just buy the stainless steel growler starting at $40.00. 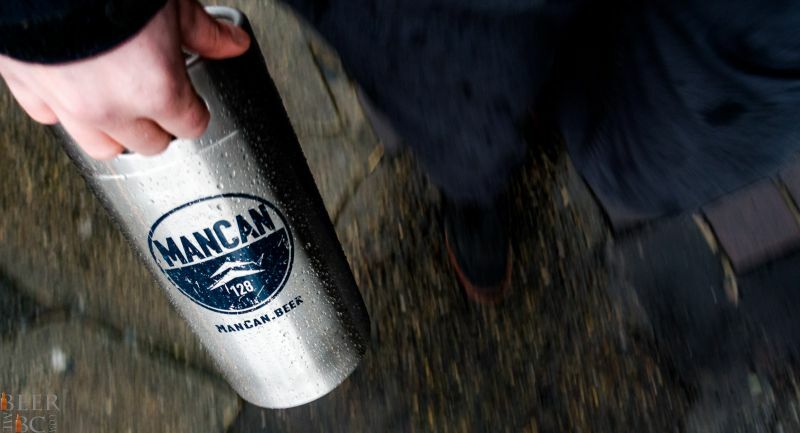 Overall, the Man Can is a premium product; it is not for your casual craft beer fan, but rather for those that want the perfect pint every time and want to one-up their friends in craft beer geek-ery. If you want to show your prowess and impress your guests, the Man Can is a sure thing! 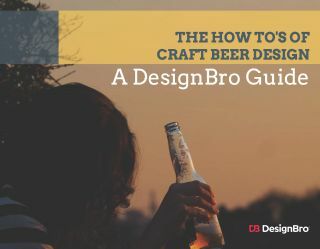 Because beer is a man’s drink. Keep your vaginas off my craft beer, ladies. Growlers are for bros only! Man, that looks tempting. How big is a schooner? But $265 is a lot of beer….